Use the GCS900 3D grade control system on your scraper to move dirt more precisely and faster without stakes, cutting costs and improving safety. This scraper grade control system is ideal for mass excavation applications including land reclamation projects, dam and reservoir construction, new infrastructure projects, and landfills and waste deposits. With the GCS900 3D grade control system for scrapers you can track GPS, GLONASS and Galileo signals and excavate in a safer, stakeless environment. From inside the cab, you can see design information and live cut/fill indications as well as monitor avoidance zones in real-time. And with the GCS900 3D you can collect as-built data as the scraper cuts to grade. The GCS900 3D grade control system for scrapers can be configured two ways. 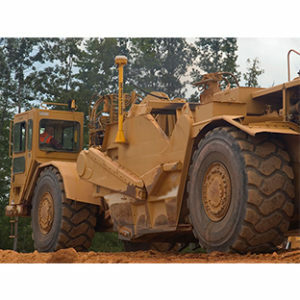 Single GNSS allows you to measure the position and slope of the blade and compares this data to the design data for rough grading and mass excavation on complex design surfaces. With Dual GNSS you can measure the exact position, cross slope and heading of the blade for rough grading and mass excavation on steep slopes as well as complex design surfaces.